Lila Moonlight: School Starts Tomorrow! It's been a long (looooong) time since I've been able to say that for me. Twenty nine years and eight months to be exact. I'm excited (translation: hyperventilating, nervous, scared, tummy rumbling, excited) about what is in store. I don't believe this semester will be all that tough but next semester will be a challenge. I'm beginning my internship (yep, it's been a long time since I've said that, too). I'm not sure exactly what that will look like but it will be in addition to my job. This morning in our worship time one of our elders asked all the support staff of a school system to stand up. Then he asked all the teachers, administrators, principals, etc. to stand. Then he asked the students to stand. I felt excited and a bit silly standing with all the students - - from the very young to...me. It reminds me of a story I heard from a friend. His mother was considering going back to school to get her master's degree. He encouraged her to do it. She said, "Yeah, but, I'm 62 years old." He dryly said, "and how old would you be if you DIDN'T go back to school." So, here I am. Fifty years old ( 51 next Saturday) going back to school. What have I done with these feelings this weekend? I've painted, of course. 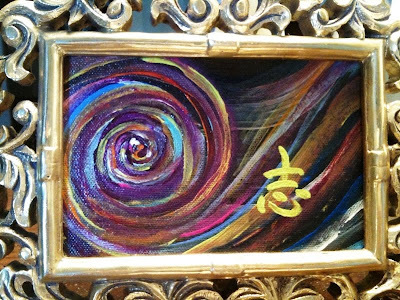 This painting is of another koru - - Maori symbol meaning new beginnings, growth and peace. The lime green symbol means "to attain one's goals." Seemed fitting. So happy for you. You'll do GREAT!! Love ya, J. Live Large or Go Home!